The Psychology Postgraduate Affairs Group (PsyPAG) is a national organisation funded by the British Psychological Society to support postgraduate psychology students. One of the key functions of PsyPAG is to host a three-day Annual Conference, bringing together over 120 postgraduate students (MSc, PhD & Practitioner Trainees) from across the UK to present their research in a supportive environment. This year the event was hosted at Northumbria University from Wednesday 26 July to Friday 28 July 2017. 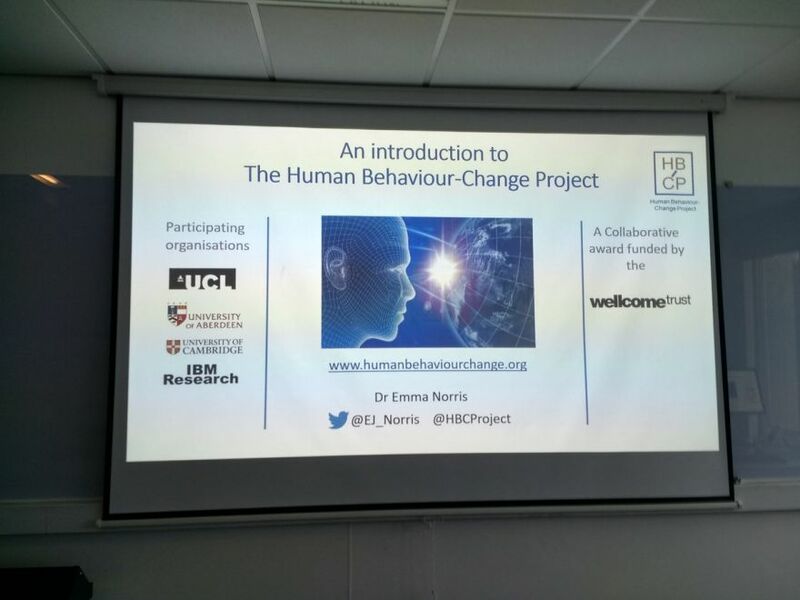 As outgoing Chair of PsyPAG and Research Associate on the Human Behaviour-Change Project (HBCP), Emma Norris (UCL) presented the initial stages of the project in the ‘Technology Symposium’. The focus of the talk was on introducing the need for synthesis of behaviour change research, given the exploding nature of the evidence base. The 3 main outputs of the project to address this problem were then outlined. Firstly, Emma summarised definitions of ‘ontologies’ and their functions, along with the initial development of the Behaviour-Change Intervention Ontology (BCIO) to unify existing understanding of behaviour change interventions. Secondly, Emma outlined the manual and automated annotation processes used within HBCP to identify features of interest from the ontology. This included HBCP’s collaboration with IBM for machine learning and artificial intelligence elements. Finally, Emma outlined the planned user interface, which will allow interested enquirers (researchers, policy makers, practitioners etc.) to interrogate the body of knowledge assessed by HBCP. Emma also reflected briefly on the transition from PhD student to Research Associate on a complex multidisciplinary project. She also highlighted the relevance of the project for systematic reviewing: often a key early component of psychology PhDs. Discussion following the talk included how ontologies have been used to benefit other health fields, such as genetics and mental functioning. There was also reflection on the diversity of information available which may be of benefit to the system being developed in HCBP, such as app data and grey literature. The presentation was a great opportunity to present a complex, multidisciplinary project to a postgraduate audience, whilst introducing terms still novel in the behavioural sciences. PsyPAG 2018 will take place at University of Huddersfield in July 2018. Download Emma's presentation from PsyPAG 2017.